Mehndi party is now celebrated with great excitement all over India and stands as an Indian version of the bridal shower party, which is celebrated worldwide. 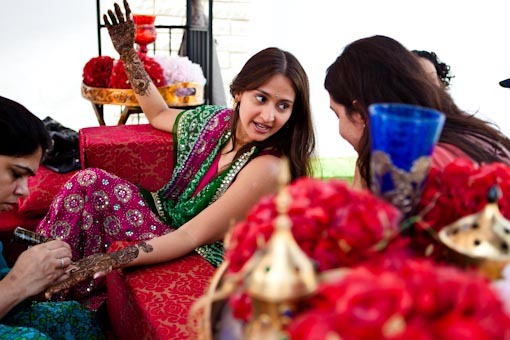 Mehndi/Henna party is the most important among the pre-wedding celebrations in India. This party is a gathering of the bride's closest female relatives and friends. It would be a really hectic job to send phone invitations to everyone for the party. It is also most likely that you will miss inviting someone important when you do this. The best way would be to go for an online invitation tool like Yoovite.Com. Simply select a template of your choice, enter the major details like the venue, date and time and send your invitations to all your friends at once. There is also an option to import addresses from your email phonebook and this makes things much easier. The main event for the Mehndi party is applying Mehndi tattoo to the bride's hands and feet. Mehndi night is usually celebrated the night before the marriage ceremony, or in some cases, a few days before the wedding day. Nowadays the bride’s family organizes a professional beautician to apply the designs on the bride’s hands and feet. It can take something around three to eight hours for the process and this depends on the complexity of the design you choose. There is also a musical program organized by the bride’s parents for the guests on this day. Popular designs of the bridal mehndi are flowers, conchshell, Kalash, doli, peacock and baraat patterns. In some places, the designs would also include the name of the bridegroom on the bride's hand. Decorations are not very common for the Mehndi party. However, you can choose some rental decoration lights to liven up the party. 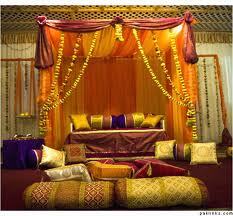 If you are using theme decorations, it is best to choose some kind of Indian theme for your Mehndi party. Your friends and cousins will have to stay the night as the Mehndi party usually goes till late night. Arranging food for the party is something that you have to do in advance. You can use caterers for the occasion since your family will be hooked to the wedding preparations and cooking for a lot of people would not be a great idea. With online invitation tools like Yoovite, it becomes so much easier to keep count of the number of guests for the Mehdi Party. The RSVP option allows your invitees to respond then and there, which makes it easier for them and for you. With an idea of the number of guests coming to the party, you can be sure of the amount of food required that would be required. It's your special day. So don't forget to have loads of fun on your Mehndi party in India.